As you’re accumulating your food storage and preparedness gear, it’s tough keeping track of what all you have. Have you ever purchased food thinking you were low on that particular item, then find out you had two more cases of it and you were actually low on something else? How about foods that hide in the corner of the food storage room or under the bed and don’t get used by their expiration date? Do you want an easy way to keep track of what supplies you have as well as when they expire and what you need to purchase? Well, there’s an app for that. 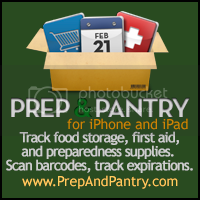 Prep and Pantry is an app for your apple device (iPhone, iPod, iPad) OR android device that makes inventorying your food storage super simple. Just scan the barcode and most items are in their database, so they’ll automatically be input into your inventory. You can also input items yourself. When you take food out to use it, just scan it again and Prep and Pantry subtracts it from your stores and adds it to your shopping list! It will even tell you which foods are expired and which are about to expire so you can use them before they go to waste. And it’s not just food, you can also inventory your medical supplies or anything else you have a collection of. The new version 2.0 enables sharing of data between family members (so you can enlist all your kids with their ipods to inventory your food storage and get it done even faster!). And the entire Thrive line is in the system, so if you’re a Thrive Life customer, those items will be an easy input! Doug from Prep and Pantry contacted me about a year ago to ask if I could test out his new app and unfortunately I was not that technologically advanced. I’m still not, although I may decide to confiscate my son’s iPod for just this app. Looks like a great app. If it were available for Android I would buy it today. I have to get this for my mom! She always ends up buying double or triple of things because she doesn’t know what she already has in the pantry. Great idea! Showing up on yet another site I read, but still not on an OS I’ll use. I bought this app about a month ago and have started to load up my food storage on it. It will take me a little while since I have over a years worth spread throughout my house for the four of us! So far so good and it is fairly user friendly. The only issue I have so far is that I hoped that when I scanned in a item that the picture would automatically pop up for it, but it doesn’t.